Bobst Library is committed to protecting an environment conducive to intellectual pursuit. Food and beverages can damage Library collections and equipment with spills and messes, and they attract rodents and other unwanted pests. Food odors and sounds are also annoying to other users. 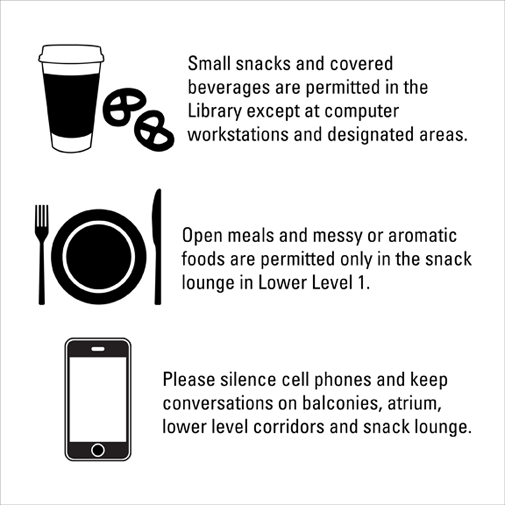 The Bobst Library Food and Drink Policy provides guidelines for Library users to enjoy an occasional snack in designated areas during study, while protecting our shared resources and maintaining a clean and welcoming learning environment for all Library users. Please adhere to the following guidelines to help preserve the materials, equipment, furnishings and environment at the library. Open plates of food, as well as messy, aromatic foods such as pizza, salad, and takeout, are permitted only in the Snack Lounge on Lower Level 1 and the Graduate Exchange on Floor 10. Individuals who have these foods elsewhere will be reminded of the policy and asked to relocate. NYU Public Safety officers will be contacted if this is a problem. Food deliveries to Bobst Library are not allowed. All areas should be as clean as, or cleaner than they were before study or use. Trash and recyclables are to be placed in the appropriate containers, and spills should be wiped up. Library users who refuse to comply with the Library Food and Drink Policy are considered in violation of the Bobst Library Code of Conduct. Thank you for helping us keep your library clean and inviting.